It was in 1942, aged 37, that Sir George Trevelyan ‘woke up’ when he attended a lecture that changed his life. He had been agnostic up to that point but when he heard the Austrian philosopher and Grail researcher Walter Johannes Stein give a lecture on ‘What did Dr Steiner mean by Anthroposophy?’ he found himself in complete agreement with what Stein was saying. It altered everything for Sir George and from that point he was able to move forward. ‘My whole soul inwardly shouted affirmation’ he wrote. It released a spiritual vision that George was able to share with the world. Sir George became an educational pioneer, inspiring orator, and is sometimes called ‘the father of the new age.’ After the Second World War he became the Warden at Attingham Park in Shropshire, a forward thinking adult education college. Here he pushed the boundaries of education with his spiritual thinking, often using poetry to illuminate his lectures. His secretary and friend Ruth Bell believed he gained his wisdom from Shakespeare, Goethe, Blake and Hopkins while embracing the romantic poets and more modern thinkers like Teilhard de Chardin, Wellesley Tudor Pole, Grace Cook (of White Eagle) and Pir Vilayat Khan: ‘George knew there were many routes up the mountain and that no one route was right for everyone.’ He also recognised the important influence of the eastern streams of spirituality flowing into the west. 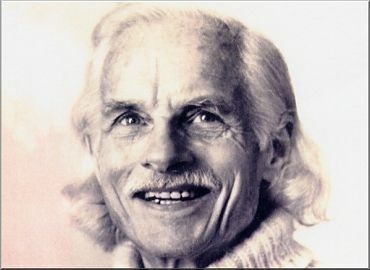 He was associated with the Findhorn Foundation and the Soil Association and created his own networks throughout Britain from the Northumbria Seekers to the Wessex Research Network. George was also responsible for launching the Lamplighter Movement in the mid 1960’s after the B.B.C. stopped broadcasting the Silent Minute. Under Wellesley Tudor Pole’s guidance Sir George promoted the Lamplighter in its early years.